I'm all about trying to make healthy choices when it comes to eating. Yes, you have to live and eat well but you also have to treat your body good. It's the only one you get. It's all about balance for me. One of my favorite lunch time restaurants is called protein bar. They have an amazing selection of wraps, salads and my personal favorite, quinoa bowls. Their prices are pretty steep so I've started making my own versions to bring into work. This is health in a bowl that tastes nothing like "health". Seriously, I'm very particular about what types of healthy food I'll eat. I have to trick my butter loving, fatty taste buds into the good for me foods. 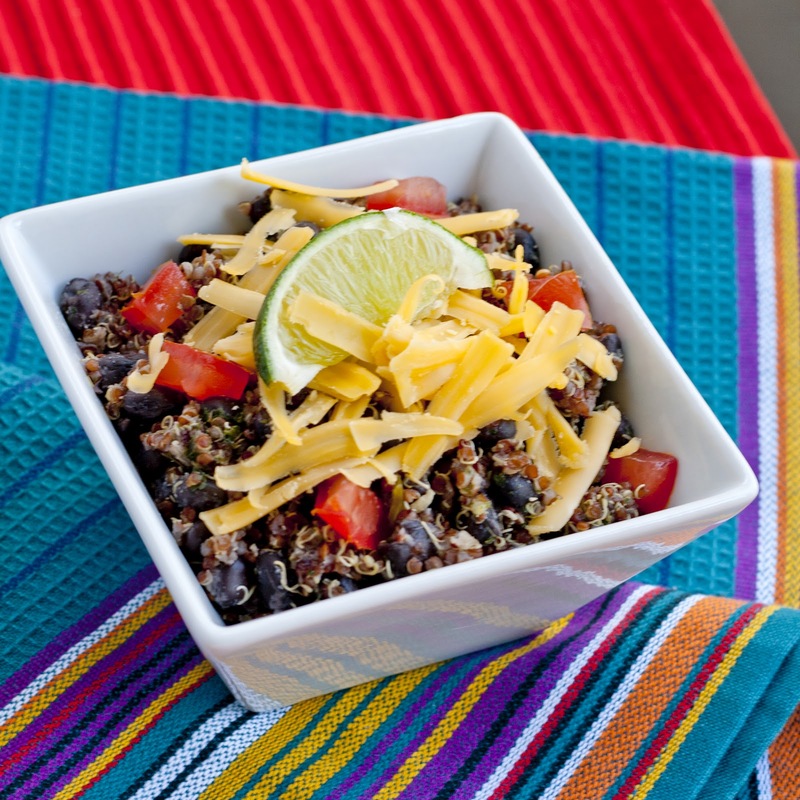 This quinoa bowl is super filling, flavorful and taste bud approved. Tomorrow I'll even show you how to turn this into a fun halloween themed lunch or side dish! Kids will go crazy for it. Or, if you're a halloween loving adult like me. Seriously, it's my favorite holiday! That or Thanksgiving. Pretty much anything involving food, orange, fall and dressing up! In a medium sauce pan, cook beans, green chiles, salsa and cumin over medium heat until warmed, about 5 minutes. Add in cooked quinoa and heat through. At the last minute, add in tomatoes and diced avocado. Stir, plate and top with shredded cheese and a lime wedge. there are a MILLION ways you can improvise this dish! 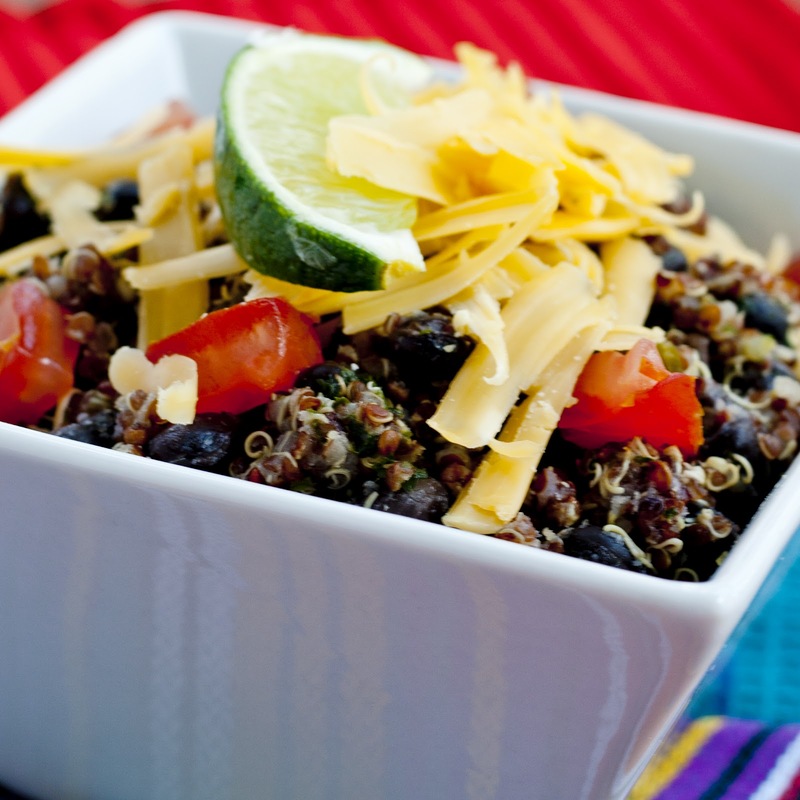 lets talk types of quinoa… there's white which is most common, red and black. I like the contrast that the red quinoa gives to the dish color wise. taste and texture are almost the same. white quinoa is a little more mushy but barley. any type you choose will be great! lets talk veggies. corn, jalapenos, diced peppers, peas, carrots, green onions, raw onion (preferably red or white), cilantro, and many many other ingredients would make great additions or substitutions to the dish. i love salsa verde but you could use any salsa here. additionally, chipotle would be fantastic if you're into smokey subtle heat. tabasco or your favorite mexican hot sauce would be delish too! also, no salsa? not to worry. you can use your favorite taco, fajita, or mexican seasoning mix and add a teeny bit of water to get it coated (try 1 TBSP of liquid at a time). i've made this with meat in the past too. chicken, steak, even marinated shrimp would work well. just make sure you season your meat! 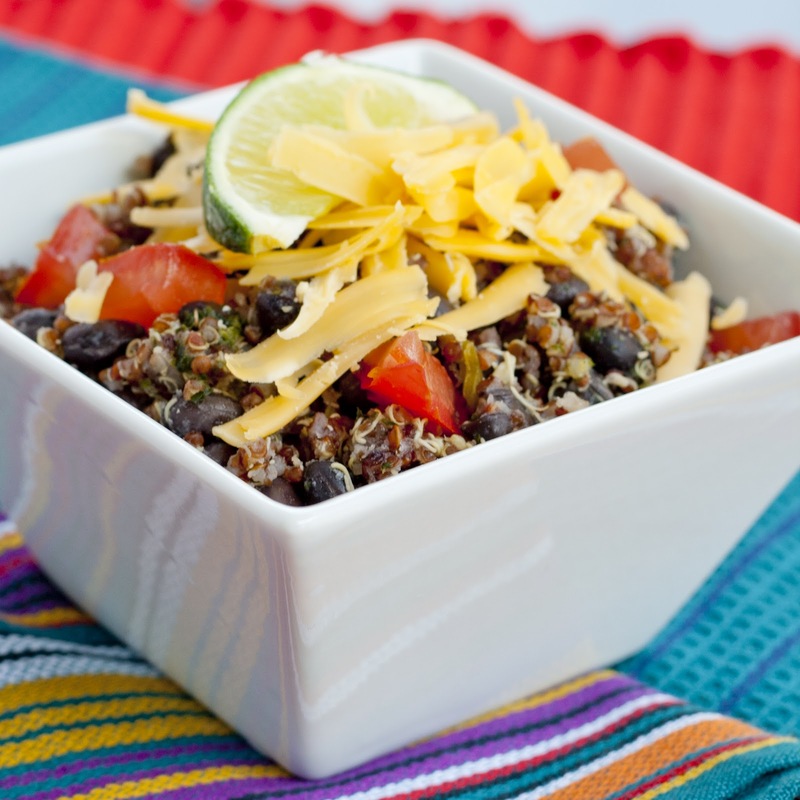 it makes a great side but when you add in meat, it's a super hearty dinner or lunch in a bowl! you can leave the cheese or avocado out but i think they make the dish. not into cheddar? chihuahua cheese or queso fresco would be delish. also, if you're feeling like a dollop of sour cream or greek yogurt, that would be fantastic too! this dish is pretty hard to mess up! ** note these images are missing avocado. mine went bad before i could shoot the recipe but i still prefer the dish with which is why i included it as an ingredient in the recipe! Look like a very interesting recipe..Eagerly waiting for some other healthy recipes too..
yay! I'm making this tonight and for my husband's portion I'll be adding some spicy chicken - can't wait! I'm always trying new quinoa recipes and I have to say this is my favorite one to date! I included this dish in my latest weekly meal plan at rainbowdelicious.com so I can share it with others. Thank you! That is such a great compliment, thanks so much Emily!!! I'm glad you loved the recipe. Thanks for sharing it with your readers too! You have a wonderful blog! Great idea. I have some cooked quinoa waiting to be used up, and I think I'll make this! I would say it feeds 2 obnoxiously but is about 4 servings. When you require a break from lettuce, tasty and fulfilling sauteed broccolini is a commendable swap, particularly with our mustard-imbued vinaigrette. Truly this post is usefull for us.